What’s the word? Hopefully all is peace with everyone. As usual, I’ve been busy grinding, to the point where I’m not on here like I want to be. This, however, will soon change, as I prepare for some pretty dope announcements. This has been a really strong year for me professionally, and it’s been really official planting some seeds and then seeing them come to life. But this is a moment I wasn’t even expecting. And those moments are ALWAYS the illest!?! So I got a text message from one of my peoples saying “Todd what’s good? You got a mention in an article in The Root – be sure to check it out.” This text was followed with a link that was so long, it rolled into a second message so I couldn’t click on it. So I did the next best thing and hit up Google. I typed in “Todd Craig the Root” and waited for the outcome. Immediately I saw an article pop up on Sam Greenlee (R.I.5). When I read the article, I found myself really stuck on stupid – it wasn’t that I just got mentioned…I was situated amongst some SERIOUS company!!! So I wanted to share it with y’all RIGHT HERE so you all could partake in this moment too. I told one of my peoples it was an honor, a blessing and a humbling experience to be playing ball in this particular game I was put in. I mean, whatever craft we choose in life, I think we all aspire to be as ill as our mentors and role models – those heavy-hitting powerhouses that were the examples and the impetus that drew us to the craft in the first place. But when you actually SEE it come to life…man, listen – does it get much better than that? Reading this article and then digesting the gravity of it just allows me to understand I’m on the right track with what I’m doing, word. So take a read one time…best believe I’ll be reading it again!!! Enjoy the moment with me, and be on the look out for these next announcements, word!!! Good people, what it is! So, I figured the first piece of writing I’d share immediately is my Keynote Address at my Doctoral Hooding Ceremony. What happens when you give me a mic at an important event…the hood gets represented properly, and we exit the building giving out the gas face!!! It was definitely a great moment – shout out to all my friends and family who came through to support me at the biggest graduation of my career (aka – the last one!!!). Since my mentor beat me to the punch, I’m just gonna put the link up to the address that’s on her site. And while you’re there, roam around and git yourself some knowledge, cuz Carmen is droppin’ jewels all day long upon the dome-piece, and that’s word! So yes, indeed it has been a long time…however, it’s been a long time for good reason. Now that I’ve finished this doctorate and it’s officially Dr. Todd Craig, we can officially git back at this BIW thing! There are definitely some updates coming up, including some new projects, some new info, and of course some straight thoughts from the brain…I think you know how I get down. But it’s definitely an exciting moment to get back to some of the creative work after a six-year movement through that doctoral program. So definitely stay tuned…more fiyah soon come, word!!! we got the new year crackin’, word! Hopefully everyone is rockin’ out properly in the New Year! I’ma take a quote from my peoples, the Kim family, and the Christmas card they sent out right at the end of 2011 “Let’s hope the Mayans were wrong!” I like that thinking, but that’s a whole different conversation, word! In the meantime, wanted to keep everyone up to speed. As y’all know, I’m knee-deep in this dissertation thing, tryin’ to get it knocked out as swiftly and coherently as possible. Cheffin’ up a really dope proposal as I type this thing (minus the hiatus I had to take when my daughter scratched my cornea…again, that’s another story). And of course, we start off 2012 right as tor’cha rocks on with more forward motion and infiltrates more minds. Shout out to Roseanne Gatto and her whole English 1000C crew at St. John’s University! They’ll be the first class in 2012 to use tor’cha, so I’m real excited about that. As well, shout out to Lillian Palermo: the first person to cop tor’cha in 2012 (that’s dope…I see you)! Roseanne and the 1000C classes will be reading and then I’ll go in and talk with them and see what’s what when it comes to the reading and the CD-Rom and what the writing process looks like. So that’s really gonna be good times, more soon on that one. In the meantime, y’all 1000C folks – scroll through the block and find that “Summer of the Student Sale” link…I may just have something real special in store for you if you do, word. And don’t sleep on that “Trifecta Series” limited edition! As always, more soon on what’s cookin’ in the blacker inkwells kitchen. I think this dissertation is really gonna blow some people’s minds, especially those who don’t know what I’m cookin’ just quite yet…chyeah!!! a hiatus from the work for the blog! So here’s the science: it’s been a little second since I’ve been able to get here and check in accordingly. There’s sooooo much info to run down, so lemme try to git you up to speed as quickly as possible. After a near-death car accident (I’m still here though, so fear not), completing my doctoral comprehensive exams (literally the following two days after the accident…the grind CAN’T stop), and watching the birth of my daughter this past June, things have been a whirlwind of hard work and absolute joy. Of course, the new edition to our family has been great. Any of you parents out there know that childbirth will CHANGE your life completely, but is the BEST thing ever! As well, while I’m raising my beautiful baby girl, it’s put a lot of things into perspective…especially my research as I complete this doctorate. While I can’t completely let the cat out the bag, I can tell you this: my work on the DJ is becoming CRAAAAAAAAZY!!! Shouts to all the DJs who I’ve been able to sit down and build with. When you see what I’ve been able to put together here, it’s really gonna be special. Hopefully it’ll leave a mark not only on academia, but also on hip-hop culture as well. I’m working real hard to make it real special…and if you know ANYTHING about me and my work ethic, you know how DEEP this thing is gonna get. I’ll definitely be up with yall to make sure you see more of what this work is. What I can say is this: it’s unfolding real nice right about now, word. In a second good peoples! Blacker Inkwells is pleased to announce the very limited edition of tor’cha, “The Trifecta Series”. Starting tomorrow, you can purchase your copy of tor’cha autographed by author Todd Craig, and the Co-Executive Producers of the tor’cha CD-ROM Project: Mr. Len (Company Flow, Smacks Records) and Havoc of Mobb Deep. Yeah, we said it…Todd Craig, Mr. Len and Havoc. This version of tor’cha is available for $20.00, and is an EXTREMELY LIMITED EDITION…and once they are gone, well, that’ll be all she wrote!!! You can get your “Summer of the Student” author-autographed copy of tor’cha (along with the CD-ROM) for $15.00 FLAT (including shipping and handling) OR you can get the limited edition “Trifecta Series” copy of tor’cha, autographed by author Todd Craig and Co-Executive Producers Mr. Len and Havoc of Mobb Deep for $20.00. As August comes to a close, make sure you get one. “The Trifecta Series” is so limited, it probably won’t be available for too long (there aren’t even 100 of these copies), and the “Summer of Student Sale” copies will be available until the Summer ends…and last we checked, it’s getting darker earlier from the view of our office windows!!! So pick ya poison, and choose wisely. But know this – once they’re gone, they’re gone! So click RIGHT HERE RIGHT NOW for your “Trifecta Series” edition of tor’cha. Or you can go to the book page for your copy of “The Summer of the Student Sale” copy of tor’cha. Either way, it’s a win-win situation all around! Enjoy August and thanks for supporting tor’cha and the blacker inkwells movement! For more info, questions, comments or international sales and shipping, feel free to contact us at info@blackerinkwells.com. Already we’re down to my last Blacker Inkwells blog…I can’t believe it. “In denial” would be an accurate way to describe my feelings about college right now. Anyway, I’d like to dedicate this week’s Journal to looking back on the past six weeks spent with Blacker Inkwells. Not to be a sap, but working with Todd has been an inspiration. Todd is the type of writer that I really envy in that he can write (seemingly) effortlessly at any length on command – and, of course, always great, creative stuff. Unfortunately, I know writing is one of those things that takes a lot of practice to get onto a higher level, but I’m hoping something has rubbed off! I’ve been lucky to have an author slash educator of his caliber read and edit my work. As it turned out, one of the last days of my internship happened to be one of the most exciting. Unless you don’t think doing an interview with the rapper Havoc of Mobb Deep is exciting, in which case you’re insane. Being a part of this upcoming Blacker Inkwells project (don’t worry, you’ll hear much more about this one soon) was one of the highlights of the past six weeks for me. Naturally, I was nervous meeting a celebrity, or as they say “rap royalty,” but the whole situation was really low-key. To have listened to his own music, played on his own speakers, and hear his personal thoughts on it was fascinating…an experience so unique that I’ll probably never do anything like it again. Suffice to say that I am very grateful for this fantastic opportunity at a behind the scenes look of how a publishing company operates. Even some of the things I neglected to mention in this and prior Journals, like the business meetings I attended and the skills I’ve picked along the way (writing press releases, formatting wordpress, etc. ), will serve me well in the future. It’s amazing to know that Todd and the Blacker Inkwells community is looking out for me. And if the work I’ve done has sped up Blacker Inkwells’ rise to the top even a little bit, well, that’s something I can be happy about. Hopefully the summer has been going well and all of you have been able to remain as cool as humanly possible in some treacherous heat!!! As August 2010 rolls in – and the Summer slowly but surely begins to roll out – blacker inkwells has had the great pleasure of having Super-Intern Scott Etkin join the movement in order to help us prepare for the next big blacker inkwells push (hold tight-there will DEFINITELY be news on this soon)! With this in mind, we here at blacker inkwells decided to do a special promo as Scott gets ready to depart to Hamilton College (y’all know we don’t mess with no slouches)! So, as a thank you to Scott and all the work he’s done, we’ve decided to unleash the “Summer of the Student” promo for all the students out there who are finishing up their summers and getting ready to gear up for September. So, without any further a due…“The Summer of the Student” begins! 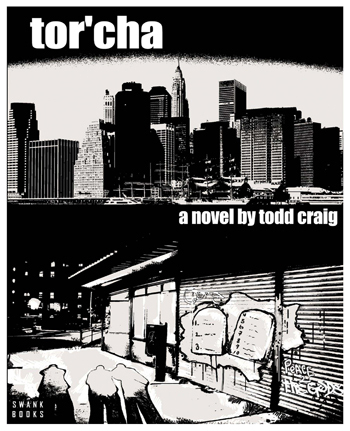 As a way to give back to the student population that has supported the book thus far, Blacker Inkwells is selling the second edition of Todd Craig’s debut novel, tor’cha, for the low price of $15.00 (which includes DOMESTIC shipping, CD-ROM and author signature). This is more than a 25% discount!!! So for everyone who wants to get another book on their summer-beach reading before its all over for Summer 2010, here’s your chance to get BOTH the novel AND the CD-ROM for a sale price you just CAN’T refuse!!! $15.00 flat via PayPal is all you need to get one of the strongest literary packages of the summer…that’s right, we said it! And the beauty of it all: just because we’re honoring the student, that doesn’t mean you must be a student to get in on this deal. So head over to blackerinkwells.com right now, click on the book, and get tor’cha via PayPal right now for $15.00 FLAT. Welcome back for the second edition of my blog! Last Saturday I was up early to check out the Harlem Book Fair with Todd. This is an important event for Blacker Inkwells since it shares a similar goal with the Book Fair: promoting African-American literature. Although I live near Harlem, it was the first time I had been to the Fair, which attracts thousands of authors, publishers and buyers annually. On a day hot enough for some Fahrenheit 451 action, three rows of plastic tables lined the blocked off street. Authors who had reserved space had been there setting up since nine, and by the time we arrived it was already a bustling scene. It reminded me of the street Fairs I am used to seeing in my neighborhood; except instead of stands selling anything from gyros to plants to socks, it was only for books and far more condensed. The atmosphere there was surprisingly intense. With sellers constantly vying for our attention, we couldn’t walk a few steps before being passed a flier or called over to a table. This certainly wasn’t my typical book-buying experience. Never once had an author personally tempted me to a nearby aisle in a Barnes and Noble. Getting this kind of close attention from those involved with the making of the book was exciting and definitely worthwhile. With the weak economy as the greatest factor, this year’s Fair was slower than past ones, according to Todd. A fast year, I’m assuming, then is something more resembling the running of the bulls. My reaction to the Fair was split: part inspiration, part intimidation. As someone who loves reading and writing it’s easy to be moved by sharing a city block with so many who share these passions. It was motivating from the standpoint of someone wanting to make a career out of writing to walk through and take it all in. After all, here was example after example of people who completed the arduous process of publishing, whether by writing or working behind the scenes, all neatly laid out in front of me in rows. Intimidation also played a role in my day due to the sheer size and social significance of the event. To give you a sense of what I mean, there were chartered buses from as far as Florida that came just for the Fair (literally, we saw Greyhounds parked out front). Then there was the tenacity of some of the sellers. But then again you have to keep in mind how much these writers have out on the line – selling their work is also selling who they are or what they believe. Getting a first-hand tour of the event also got me excited for next year, when Blacker Inkwells will be back with a vengeance. Without giving anything away right now, let me just say you won’t want to miss it. One of my first ongoing projects of the summer is beginning to digitize Blacker Inkwells music archive for use on various mixtapes or soundtracks related to his writing. Therefore, the first few days on the job were spent learning my way around a turntable and the computer program Audacity. Considering I had never really handled vinyl before, let alone actually played it, just putting it on, cleaning it, letting it spin and pressing record seemed risky. Fortunately, the required skill set doesn’t exceed that. Although I’m a beginner at the art of DJing (rather, what’s below beginner? Novice? What’s below novice? ), I have to admit that simply adjusting the volume dials is a cool feeling. Needless to say, I have a newfound respect for DJs everywhere. Hip-Hop is one of the many interests Todd and I have in common. While I’d like to consider myself reasonably well-versed in the genre, my knowledge does not go beyond the classics and some of the better-known underground artists. But this is little help to me considering that the majority of Blacker Inkwell’s archive is from the late ‘70s into 2000 – outside my scope. But it turns out to be a great opportunity for me, however, because working with records primarily from the founding years of hip-hop, listening to Todd’s collection has resembled a kind of history lesson. There have been moments throughout listening to the records while they’re recording in which I’d catch something that sounded really familiar and have it curiously linger with me for a while. Later, I began to realize these certain lines, or parts of a verse, that I recognized had been cut from older songs and used as the hook on a more recent track. Although it may seem unoriginal, using parts of a song from over twenty years ago as inspiration for their own music is a true homage to hip-hop’s roots. For example, I’ve heard of NWA’s infamous “F The Police,” but not Jay Dilla’s earlier version. Therefore, the stuff I’m used to hearing now isn’t so different from the music Todd grew up on. This method of recycling material comes full circle in the greater scheme because it links the music I know back to the tracks that established hip-hop in the first place. Despite our common interests, it’s true that Todd and I are of different generations. Growing up in the 2000s, as far as I know music comes from a box, aka an iPod. How does it get there? I don’t know. But when you click the song, it plays. Working with vinyl, however, has a whole different feel about it. There is something about dropping the needle on the record and watching it spin that creates a much deeper connection to the music. Not only is it a grittier experience than having the music pre-packaged for you, but it also feels more closely related to the production of the song. The imperfections in the audio can always be removed on a computer, but hearing the little skips and pops makes me feel like I’m in the studio with the artist, he’s behind the glass and I’m in front of a huge soundboard just bobbing my head. I never would have expected getting this sense of closeness to the music simply by counting the rings in the record, watching the waves bounce or feeling the record’s weight in my hands. While some of the content of hip-hop (at least among the deeper, perhaps less commercial artists worth listening to – more Talib Kweli, less Lil Wayne) certainly remains throughout the years, it is a shame that the intimacy one feels with the music itself by handling vinyl has been replaced by the demand for convenience in the form of an iPod. So as far as internships go, I’d say I’m one of the lucky ones. While other kids my age are getting coffee and sending faxes, I’m reading, writing and listening to great music – can’t ask for much more than that. Of course, sliding how I’m now an amateur DJ into conversations doesn’t hurt either.